In small bowl, mix walnuts and granulated sugar. Lightly brush dough with milk; sprinkle each evenly with walnut mixture. Bake 8 to 12 minutes or until bottoms are golden brown. Meanwhile, in another small bowl, mix yogurt and pudding until well blended. Stir in banana. Remove pastries from oven. Immediately turn pastries over with pancake turner; gently fold each in half along sealed seam, walnut mixture side out. Remove from cookie sheet; place on wire rack. Cool completely, about 15 minutes. To serve, place pastries on individual dessert plates; fill each with about 3/4 cup yogurt mixture. 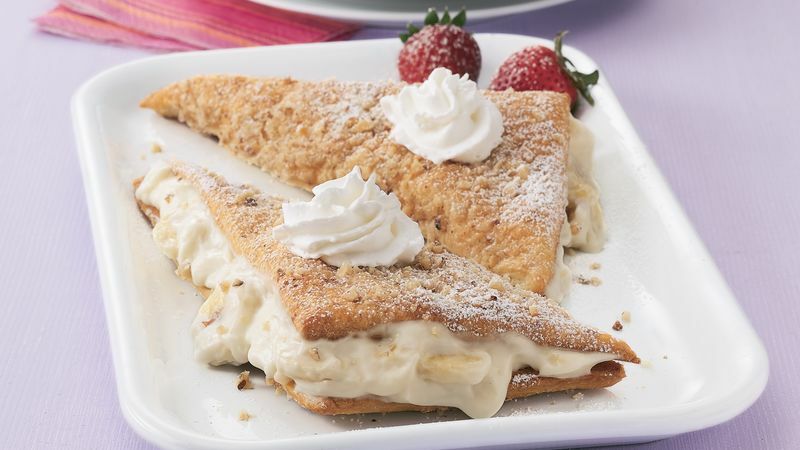 Garnish each with dollop of whipped cream topping; sprinkle with powdered sugar.